When the World Health Organization announced in November that the Zika virus was no longer a public health emergency, it sounded like good news. But a closer look at the findings from an emergency committee on Zika show that it will remain “a significant, enduring public health challenge” for years to come. 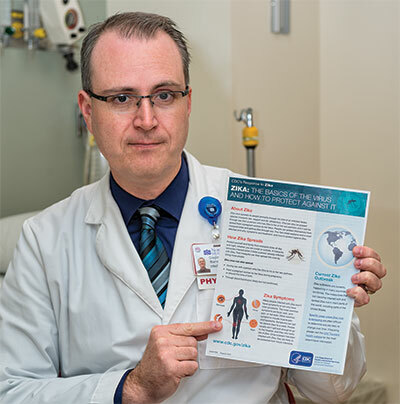 That means that education will continue to be important so people can protect themselves, especially when traveling to parts of the world where Zika is a higher risk, said Greg Warner, D.O., NorthBay Healthcare’s infectious disease expert. It is most prevalent in Central and South America and the Caribbean. The virus is primarily transmitted by two species of mosquitos, which are not native to the Bay Area. In addition, Zika can also be transmitted through sexual contact, or from a woman to her fetus. The biggest risk, of course, is for pregnant women and their babies. Zika infection can cause birth defects, including microcephaly and other severe fetal brain defects, as well as impaired growth, hearing and vision. Zika infection can cause birth defects, including microcephaly and other severe fetal brain defects, as well as impaired growth, hearing and vision.